RCS 705 type regulator is known also as pressure stabilizer and is made for individual home heating machines and gas powered water heaters. This model ensures a constant outlet pressure of 20 mbar, allowing safe and high efficiency functioning of heating machines. The FE series gas regulators are two stage, self-driven type regulators, suitable for use in civil and industrial plants, designed for gaseous liquids, LPG, natural gas and other non-corrosive gases. They are designed for direct mounting on the gas meters or supply lines in civil plants. They may be mounted in any position, in indoor spaces. Dival 160 AP is a direct driven, diaphragm controlled regulator, with counter spring, for medium an high pressure. To be used for non-corrosive, previously filtered gases. Optionally, it allows the mounting of a shut-off device, even on already installed regulators, requiring no pipe modifications. Easy maintenance is possible without detaching the body from the pipe. Dival 500 is a downstream direct acting, low, medium and high pressure regulator. It is used for filtered, non-corrosive gases and liquefied gases. Due to its balanced plug design, it offers a high pressure control accuracy and a reduced response time. The high modularisation degree allows the adding of alternative devices and fixtures (shut-off valve, relief valve), as well as including the line monitor function (auxiliary regulator). Inlet/outlet threaded connections: DN 1" + DN 1" or DN 1" + DN 1 1/2"
Dival 600 is a downstream direct acting, low and medium pressure regulator. Its modular design allows the adding of auxiliary devices (slam-shut valve, relief valve, noise damper, monitor function adapter). The extremely short response time make Dival 600 suitable for use in burner plants, industrial plants etc., where large flow variations may occur. The HP100 - HP100/B series include self-driven, direct acting, balanced plug, diaphragm controlled and counter spring regulators, for medium and high pressure. They are designed for use in natural gas/LPG distribution plants (non-corrosive gases), which require a high control accuracy and a short response time to flow variations. Very suitable as 1st stage pressure regulators in home and industrial plants. The NORVAL series regulators are direct acting, diaphragm controlled and counter spring regulators, for medium and low pressure. To be used in distribution plants for non-corrosive, previously filtered gazes. They feature by extreme quick response to the changes of the operating conditions, thus being especially suitable for ON-OFF burner plants and other industrial processes in which rapid flow fluctuations occur. Design pressure: 19 bar max. The TRIAS/BM - TRIAS/BB series regulators are direct acting, diaphragm controlled and counter spring regulators, for medium and low pressure. 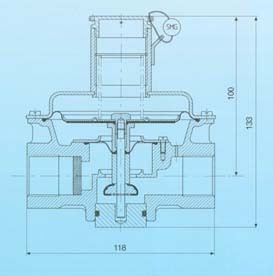 These devices require selfstanding closing parts and tightening surfaces, thus making it possible to reduce the overall dimensions, but also keeping the required safety devices. Flange connections 1"1/2 and 2"
To be used in civil and industrial installations for natural gas, LPG, or other non-corrosive gases (dry gases). COMPACT versions (FRG/2MBC, FRG/2MCC, RG/2MCC) are suitable for small consumers. Designed for use in two-stage LP Gas systems. R222 series regulators offer improved durability, accurate pressure regulation, easy installation, superior overpressure protection and high corrosion resistance. 20 years recommended life time. R622 series regulators offer improved durability, accurate pressure regulation, easy installation, superior overpressure protection and high corrosion resistance. Positive drainage eliminates blocking problems caused by freezing. Stainless steel inlet screen protects against debris. The S202G series regulators are low pressure, large capacity commercial/industrial units for applications of small extent. They have excellent shock resistance, high response speed, superior control accuracy and require easy maintenance. Low pressure regulators, flow rates between 1,1 and 1,5 kg/h. Use for domestic purposes, such as gas supply from compressed gas cylinders. Low pressure regulators, flow rates between 4 and 12 kg/h. Use in civil and industrial purposes. High pressure LPG regulators, first stage, flow rates between 40 and 180 kg/h.